WASHINGTON, DC, January 20, 2011 (ENS) – Two giant pandas born in China that have been on loan to the National Zoo for 10 years will remain for awhile under an agreement signed today by Chinese and U.S. officials in concert with the state visit of Chinese President Hu Jintao to the United States. The agreement, signed by Dennis Kelly, director of the National Zoo and Secretary General Zang Chunlin of the China Wildlife Conservation Association, extends the Zoo’s giant panda program for five more years. 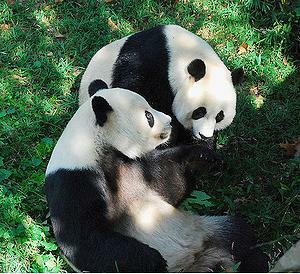 Mei Xiang and Tian Tian have lived at the National Zoo since December 6, 2000. Both pandas were born at the China Conservation and Research Center for the Giant Panda in Wolong and had parents that were wild born. Mei Xiang, whose name means “beautiful fragrance,” will turn 13 on July 22 and Tian Tian, whose name means “more and more,” will turn 14 on August 27. The first two years of the agreement include a cooperative study involving reproductive experts from the China Conservation and Research Center for the Giant Panda in Wolong and the Smithsonian’s Conservation Biology Institute to oversee the breeding of Mei Xiang and Tian Tian. If after two years, either panda is found unsuitable for breeding, the two institutions will enter into discussions about the possibility of exchanging the pandas with another pair to support China’s conservation efforts. Tai Shan has lived at the Wolong’s Beifengxia Base in Ya’an, Sichuan province since February 4, 2010. If the two pandas produce another cub at the National Zoo, the cub will be allowed to stay at the zoo until the age of four. Previously, cubs were to return to China before age two. Both parents and any offspring remain under the ownership of China. Currently, four zoos in the United States host giant pandas under exchange agreements with the Chinese government: Zoo Atlanta, Memphis Zoo, the San Diego Zoo, and the National Zoo – more than any country outside China. Salazar commended the work of a delegation from the department’s U.S. Fish and Wildlife Service who met with Chinese officials in Beijing late last year to strengthen ties on panda conservation and improve coordination in the overall effort to save the species and its rapidly declining habitat. Those discussions led to consensus on a new framework for working with China on its priorities for giant panda conservation under which the government of China will fund specific projects to support wild panda conservation based on a mutually agreed list of activities. In Beijing, the Chinese expressed their intent to initiate a new 10-year survey and census, and build on their recent efforts to begin panda reintroductions into the wild. These efforts are funded, in part, through cooperative agreements with the National Zoo and other U.S. zoos authorized by the Fish and Wildlife Service’s Giant Panda Policy under the Endangered Species Act and the Convention on International Trade in Endangered Species. The ongoing funding effort included the transfer of $10 million from U.S. zoos with giant pandas, which China will use to support its panda conservation efforts. “We are committed to supporting China’s efforts to conserve wild pandas and their habitats, as well as China’s intent to shift captive-breeding efforts toward the reintroduction of giant pandas into the wild,” said Secretary Salazar.